The Most Epic Non-Dairy Frozen Dessert Combos! With that summer heat in full swing, cold treats in the middle of a summer fun day are a must! My daughter and my favorite cold summer treat? Ice cream! There’s just something that feels so nostalgic of childhood to have a bowl of ice cream on a lazy hot afternoon. While it’s a fun treat to have with my daughter, finding an ice cream that’s low in calories or is dairy-free is a huge plus (And of course tasting delicious is a must, too). We recently heard that Vons + Pavilions in the Los Angeles, CA area was carrying Open Nature® ‘s new line of “Scandal-Less” Light Ice Cream as well as Open Nature® Non-Dairy Frozen Desserts. Since we live right by a Pavilions, we headed over to grab some flavors to keep on hand for delicious summer treats! The selection of Open Nature Scandal-Less Light Ice Creams were pretty impressive, being low in fat (they were 60-80% less fat than regular ice cream!) and high in protein, and were just 240-370 calories a pint! The Non-Dairy Frozen Desserts are made with almond or cashew milk, and come in some pretty tasty flavors. We picked up Open Nature’s Non-Dairy Frozen Desserts in Peanut Butter & Cookies, Coffee Caramel Fudge, and Chocolate Fudge Brownie. My 3 favorite flavors (peanut butter, chocolate, coffee) are all covered! My daughter was pretty excited to pick them out to try them at home too! Once we were home, we first tried the Coffee Caramel Fudge. It tasted just like regular ice cream even though it was made with almond milk, and each of the flavors in this frozen dessert stood out, and had an amazing texture. 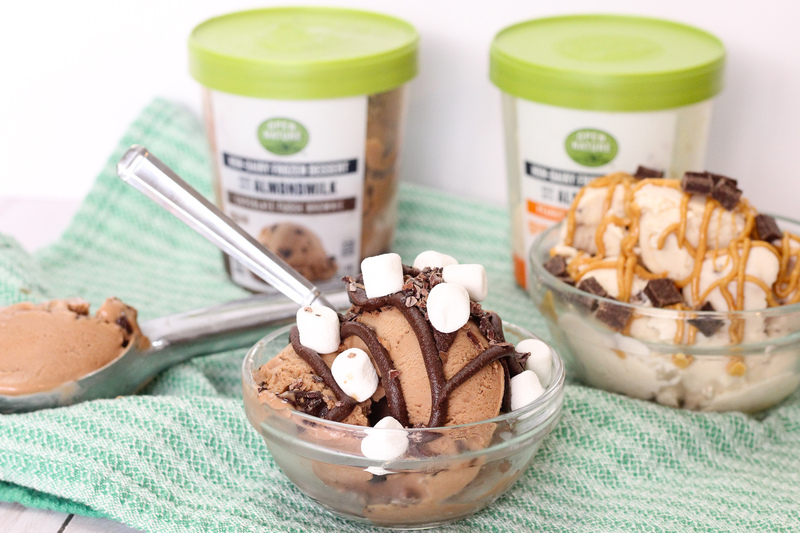 To add some more fun flavors to our Peanut Butter & Cookies and Chocolate Fudge Brownie Open Nature, we made sundaes with some non-dairy toppings. Being a peanut butter lover, I absolutely LOVED this flavor (it was my favorite of the ones we tried). We drizzled on some unsalted natural peanut butter for extra creaminess, and sprinkled carob chips on top. The added creamy and chunky textures made it an extra fun and delicious treat! I find that some non-dairy chocolate flavored desserts aren’t super chocolately, but this one was packed with rich flavor! We added some mini marshmallows, carob shavings, and cocoa almond butter. It had a rocky road type taste, perfect for summer nights in the backyard with your littles! I buy my Open Nature non-dairy frozen desserts at my local Vons or Pavilions in Los Angeles, CA. You can also find them exclusively at Albertsons and Safeway. You can visit Vons.com to find a store near you and discover more recipe ideas. Reader Comment Disclosure: Comments submitted may be displayed on other websites owned by the sponsoring brand. This is a sponsored conversation written by me on behalf of Albertsons Companies . The opinions and text are all mine. A Simple Week Long Meal Plan That Even Toddlers Will Love!